I don’t know if it’s a Symantec update or a Spotify update but one of them thinks the other is b0rken. My phone is getting increasingly unreliable (from all the abuse i've given it, i'm sure -- but it's been mutual abuse so i call it justified). I have now come to the point where i'm ready either to factory reset the machine using conventional means or with a mallet. Keep holding the four finger salute until your phone asks in which country it is. Voila, your phone is reset. Before doing that, there are a couple of recommended measures. Run PC Suite backup and synch your stuff with Mail for Exchange. In the state your phone is, it'll probably fail, but you can try nonetheless. And that's it. See you on the other side. Test. Detta hände länge sen. I just had a very Douglas Adamsy moment. There's a passage i love in one of his books where there's a big hole in the space ship but the hole in question also knocked out the sensor that would have told the monitor computer that there's a piece of the space ship missing. Which causes the maintenance robot to fall through the hole in the space ship because it does not know it exists. The moral of the story? Monitor your monitors. The case in question? Email. I have two email accounts that i use, one with the gmail domain name and one on my vanity domain. I actively use the Gmail account because i got it first, but i use the vanity email address for all outgoing mail regardless from which email address i send it. 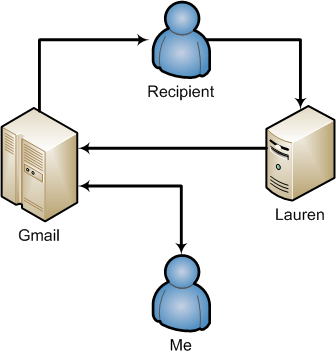 This means that when i send mail from Gmail, the replies get sent to the vanity domain which are automagically forwarded back to my Gmail account. It's a bit of a hack, but it has worked so far. At some stage in December apparently, i managed to mistype the forwarding settings so that all my email to the vanity domain got forwarded to another user at Gmail. Of course, i was not aware of this. I just stopped receiving some of my email. I just never attributed that to my own stupidity. But i should have. When i today checked my vanity domain, i had a bunch of non delivery reports from that other account. Not very cool. I suppose i could go and send an apology mail to that other user but i fear that too is going to be bounced. So if you haven't received a response from me to a mail you sent to my vanity domain, i am sorry (this, unfortunately also goes for billing statements sent from my ISP). My fault. Mails should be delivered now. And i shall cluebat myself just to improve my memory.